Robert Paxton Gronkowski (born May 14, 1989), nicknamed "Gronk", is an American football tight end for the New England Patriots of the National Football League (NFL). He played college football at Arizona, winning several awards, including being named a Sporting News and Rivals.com freshman All-American. Gronkowski was raised in Williamsville, New York, and attended Williamsville North High School for three years. He played football, as a tight end, and basketball, as a center. As a junior playing football, he recorded 36 receptions for 648 yards and seven touchdowns on offense, and 73 tackles and six sacks on defense. He was named an All-Western New York first-team and All-State second-team player. In 2006, Gronkowski moved to suburban Pittsburgh, where he attended Woodland Hills High School in Churchill as a senior. Initially ruled ineligible by the Western Pennsylvania Interscholastic Athletic League, he recorded eight receptions for 152 yards and four touchdowns at Woodland Hills, after the ruling of ineligibility was overturned. He was named a SuperPrep All-American, PrepStar All-American, Associated Press Class 4-A all-state, Pittsburgh Post-Gazette "Fabulous 22", Pittsburgh Post-Gazette first-team all-conference, The Patriot-News (Harrisburg, Pennsylvania) "Platinum 33", and a Pittsburgh Tribune-Review "Terrific 25" player. He was recruited by Kentucky, Arizona, Clemson, Louisville, Maryland, Ohio State, and Syracuse. Following high school, he attended University of Arizona and played for the Arizona Wildcats football team from 2007 to 2009. As a freshman in 2007, he recorded 28 receptions for 525 yards and six touchdowns. His 18.8 yards per reception average was the best on the team and his receiving yards were a school record for a tight end. He was named The Sporting News freshman All-American, Rivals.com freshman All-American, The Sporting News freshman Pac-10, and All-Pac-10 honorable mention player. Gronkowski missed the first three games of the 2008 season, but later recorded 47 receptions for 672 yards and a team-best ten touchdowns. Five of his touchdowns were scored in his first two games. He twice was named the John Mackey National Tight End of the Week, including his performance in a failed comeback bid against Oregon, when he caught 12 passes for 143 yards. He set the school records for a tight end for single-game, single-season, and career receptions, yards, and touchdowns. Gronkowski was named an Associated Press third-team All-American and All-Pac-10 first-team tight end. Prior to the 2009 season, he was placed on the watchlist for the Lombardi Award, which is awarded to the most outstanding college football lineman or linebacker. He missed his junior season in 2009 due to back surgery, which caused his draft stock to fall. During the preseason, Gronkowski was one of three NFL players to score four touchdowns, tying Victor Cruz, a rookie wide receiver for the New York Giants, and Anthony Dixon, a running back for the San Francisco 49ers. 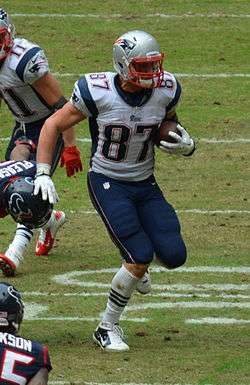 In the Week 1 game against Cincinnati, Gronkowski caught his first regular season touchdown in the fourth quarter on a one-yard pass from Brady. Visiting his home city of Buffalo in Week 16, Gronkowski caught two touchdowns against the Buffalo Bills, and added a touchdown in the season finale to give him 10 on the season; in 16 games played (11 starts), Gronkowski caught 42 passes for 546 yards. Despite missing his entire 2009 college season following back surgery, Gronkowski did not miss a single game or practice all season; he was the first rookie tight end since the NFL-AFL merger to score 10 touchdowns. Gronkowski (#87) in a 2011 game against the Indianapolis Colts. Gronkowski caught his first touchdown of the 2011 season on a 10-yard pass from Tom Brady in the Patriots' Week 1 victory over the Miami Dolphins; Gronkowski's 6 catches accounted for 86 of Brady's franchise record 517 yards. In Week 11, Gronkowski caught two touchdown passes, including a career-long 52-yard catch and run, to equal his 2010 TD total in just ten games; he passed his reception and yardage totals from 2010 in only eight games. Through Week 11, Gronkowski led all tight ends with 10 touchdowns; his 20 TDs were the most ever for a TE in his first two seasons. His reception and receiving yardage totals both ranked second among TEs (after Jimmy Graham of the New Orleans Saints), and in the top ten among all receivers, though they only ranked second on the Patriots, behind Wes Welker. Gronkowski broke the NFL record for touchdowns scored in a single season by a tight end when he had the second three-TD game of his career in the Patriots' Week 13 victory against the Indianapolis Colts. After scoring two TDs on receptions from Tom Brady, Gronkowski scored a third touchdown from 2 yards out. Initially declared a forward pass, the pass was later ruled a lateral pass, which is recorded as a rushing attempt; it was the first rushing attempt of Gronkowski's career, and his first rushing touchdown. It was also the first rushing touchdown by a tight end since Bo Scaife did it in 2006, and the first in Patriots history. At game's end, Gronkowski had sole possession of the touchdown scoring record, with 14, and shared the record for receiving touchdowns, 13, with Antonio Gates and Vernon Davis. Gronkowski took sole possession of the TE receiving record a week later against the Washington Redskins, in which he caught his 14th and 15th touchdown passes of the season; in total, he had six receptions for a career-high 160 yards. His performance also earned him his first AFC Offensive Player of the Week award, and, for the second week in a row, NFL.com's "Hardest Working Man" award. He ended the season with 1,327 receiving yards, breaking the previous NFL record for a tight end of 1,310 set by Jimmy Graham of the Saints earlier that same day. He also finished with 18 total touchdowns, 17 receiving—both NFL records for tight ends. Gronkowski's 18 touchdowns were the second-highest total in the NFL (after Philadelphia's LeSean McCoy, who had 20), and equaled the output of the entire St. Louis Rams team. His 17 receiving touchdowns were the most of any NFL player in 2011, marking the first time in NFL history a tight end had sole possession of the league lead. In the Patriots' first playoff game, a 45–10 rout of the Denver Broncos in the Divisional round, Gronkowski tied an NFL post-season record, catching three touchdown passes as part of a 10-catch, 145-yard effort. Gronkowski alone had more catches than the entire Broncos offense, as quarterback Tim Tebow completed just 9 of 26 passes. For the second playoff game, a 23–20 win over the Baltimore Ravens, Gronkowski suffered a high ankle sprain on a tackle by Ravens safety Bernard Pollard; the status of his ankle was one of the major story lines in the run-up to Super Bowl XLVI. But, Gronkowski still managed to finish with 5 receptions for 87 yards. 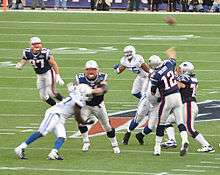 In Super Bowl XLVI, the Patriots decided to start Gronkowski, but he wasn't a large factor in the game. With only a few seconds left in the Super Bowl XLVI, Gronkowski had a chance on Tom Brady's Hail Mary as time expired, but his dive for the ball came up short. Gronkowski finished the game with 2 receptions for 26 yards, which was his lowest output since early October. The Patriots lost the Super Bowl to the New York Giants, 21–17. A few days after the Super Bowl, Gronkowski had an MRI of his injured ankle that revealed strained ligaments and required surgery to repair. On June 8, 2012, Gronkowski signed a six-year, $54 million contract extension, the largest ever for an NFL tight end. The contract included an $8 million signing bonus, but otherwise left the 2012 and 2013 seasons of his rookie contract intact. Gronkowski broke his left forearm late in the fourth quarter during an extra point in the Patriots' 59-24 victory in Week 11 over the Indianapolis Colts. Before doing so, however, he became the third tight end in NFL history (after Tony Gonzalez and Antonio Gates) to achieve three seasons with at least 10 touchdown receptions, and the first ever to do it in consecutive seasons. Gronkowski returned to practice in Week 15, and participated in the Week 17 game against the Miami Dolphins, scoring a touchdown. He re-injured his left arm in the first quarter of the Patriots' first playoff game, against the Houston Texans. He required another operation, and missed the remainder of the playoff. In 11 games in 2012, Gronkowski had 790 receiving yards and 11 touchdowns. In February 2013, Gronkowski was diagnosed with an infection in his forearm. He underwent an open procedure—the third on his forearm—in an effort to clear the infection; he was subsequently placed on a course of antibiotics. On May 20, 2013, Gronkowski underwent a fourth surgery on his forearm to replace the hardware implanted in the second procedure and perform tissue biopsies. ESPN's Adam Schefter reported that doctors were encouraged the infection had finally resolved. On June 18, 2013, Gronkowski underwent back surgery. He was cleared to play for the October 20, 2013, game against the New York Jets. During a game against the Cleveland Browns on December 8, 2013, Gronkowski suffered a right knee injury after a direct hit from T.J. Ward. Gronkowski tore his ACL and MCL, which prematurely ended his 2013 season. In 7 games (6 starts), Gronkowski produced 592 receiving yards and 4 touchdowns. In his first game back from ACL/MCL surgery, Gronkowski managed to catch four passes for 40 yards and a touchdown against the Dolphins in a losing effort, 33–20. He played on limited snaps as the Patriots worked him back to full strength slowly. Against the Vikings in Week 2, Gronkowski logged another 4 receptions for 32 yards in a 30–7 win. Against the Raiders in Week 3, Gronkowski caught 3 balls for 44 yards and his second touchdown of the season, and the only touchdown scored in the Patriots' 16–9 victory. Through Week 3, Gronkowski logged 1 start, 11 receptions, 116 receiving yards and 2 touchdowns on only 109 offensive snaps (42% of the team's offensive total). Gronkowski broke out in Week 8 against the Bears, catching 9 passes for 149 yards and 3 touchdowns. In week 14 against the San Diego Chargers, Gronkowski became the first tight end in NFL history to catch at least 10 touchdowns in four separate seasons. Gronkowski was a major factor in the Patriots' 28-24 Super Bowl XLIX win over the Seattle Seahawks, recording 6 catches for 68 yards and a touchdown late in the second quarter. Gronkowski was fined twice this season, once for "unnecessary roughness" against Indianapolis Colts safety Sergio Brown, and the other time occurring during Super Bowl XLIX. Gronkowski, among three others, was fined $8,628 for "striking an opponent." Gronkowski was named to his third Pro Bowl and was the unanimous choice for tight end on the 2014 All-Pro Team, receiving all 50 votes. At the 2015 ESPY Awards, Gronkowski won the Comeback of the Year award for his 2014 season. After missing a week, Gronkowski returned for the Patriots' December 13 game against the Houston Texans. He caught four passes for 87 yards and a touchdown, for a total of 10 touchdowns and 1,018 yards on the season. The Patriots won, 27–6, to snap a two-game skid. In the Patriots' 27–20 win over the Kansas City Chiefs in the AFC Divisional Round, Gronkowski caught seven passes for 83 yards and two touchdowns. In the AFC Championship game, a 20–18 loss to the Denver Broncos, Gronkowski led all receivers with 8 catches for 144 yards and a touchdown. Gronkowski missed the first two game of the season due to a hamstring injury and was limited in his next two games. Against the Buffalo Bills in Week 8, Gronkowski scored the 69th regular-season touchdown of his career, which was also his 68th receiving touchdown. Both broke Patriots franchise records set by Stanley Morgan. In Week 10 against the Seahawks, he took a big hit to the chest by Earl Thomas which was initially thought to be a punctured lung turned out to be a pulmonary contusion, keeping him out in Week 11. The following week in Week 12 against the Jets, he suffered a back injury which needed surgery to repair a herniated disk and was out for the season. He was officially placed on injured reserve on December 3, 2016 after having surgery the previous day. In March 2012, Gronkowski signed a two-year deal with Dunkin’ Donuts to endorse their products and appear in radio and television spots. In August 2012, Gronkowski became an investor and sponsor of the premium sports drink, Bodyarmor SuperDrink. In September 2012, PLB Sports produced a frosted corn flakes cereal named Gronk Flakes that was sold in New England at Stop & Shop supermarkets. Gronk Flakes are made by the same company that produced Flutie Flakes. A portion of proceeds will benefit the Gronk Nation Youth Foundation. In January 2015, Gronkowski teamed up with opendorse to promote a Zynga mobile application called "NFL Showdown: Football Manager". In his book It's Good to be Gronk!, Gronkowski has written that he hasn't spent any of his money he has earned through his NFL contracts and strictly lives off the earnings from his endorsement deals and appearance fees. His salary over the first five years was over $10.0 million. In April 2016, NFL star Gronkowski launched with Monster Energy a signature "Gronk" beverage that will be distributed by Coca-Cola. In May 2016, EA Sports announced that Gronkowski, who finished second to Odell Beckham Jr. in fan voting for the cover of its Madden NFL 16, would be the cover athlete for Madden NFL 17; no vote was held. Gronkowski is the second youngest of five brothers, all of whom played collegiate sports. The eldest, Gordie Jr., played baseball at Jacksonville University, and played several years of affiliated and independent league baseball, last appearing professionally for the Southern Illinois Miners of the Frontier League in 2011. Dan played as a tight end at Maryland and was selected in the 2009 NFL Draft, he played for five years in the NFL. Chris played football for two years at the University of Maryland before transferring to Arizona and playing for four seasons in the NFL. The youngest brother, Glenn, is also a fullback for the Patriots. Gronkowski is known for his fun-loving personality, with Patriots quarterback Tom Brady being quoted as saying "Gronk is a one of a kind person, player and friend. He is one of the most positive people I have ever been around and he loves to have fun. What you see is what you get and whether he is dancing, singing, laughing, or spiking, he is true to himself." Gronkowski said that partying improves his playing abilities, noting, "You go out and get refreshed, and it just makes you want to go back out on that practice field and keep going hard." 1 2 3 4 "Player Bio: Rob Gronkowski". University of Arizona. Archived from the original on April 24, 2009. Retrieved 2009-04-30. ↑ White, Mike (2006-08-26). "WPIAL benches high school football transfer". Pittsburgh Post-Gazette. Retrieved 2010-11-17. ↑ "Rob Gronkowski Profile". Scout.com. Retrieved 2009-04-30. ↑ "Gronkowski on Early National Radar". University of Arizona. 2009-03-02. Retrieved 2010-04-27. ↑ "Unearthed pre-draft evaluations from 2010 reveal Raiders thought Rob Gronkowski was 'best all-around player in the draft'". It Is What It Is. Retrieved 2016-05-09. ↑ Reiss, Mike (2010-07-25). "Gronkowski signs rookie deal". ESPNBoston.com. Retrieved 2010-07-25. ↑ "Player Game Finder Query Results". Pro Football Reference. Retrieved 2010-11-17. ↑ "Like Mark Bavaro, New England Patriots TE Rob Gronkowski fits coach Bill Belichick's mold - ESPN Boston". Sports.espn.go.com. 2011-02-03. Retrieved 2012-01-28. ↑ Reiss, Mike (2010-12-22). "Where Pats rank in fan Pro Bowl voting". ESPNBoston.com. Retrieved 2010-12-22. 1 2 "Rob Gronkowski finds new way to reach end zone - ESPN Boston". Espn.go.com. 2011-12-04. Retrieved 2012-01-28. ↑ "Rob Gronkowski on track to be one of NFL's greatest". The Boston Globe. 2011-12-05. Retrieved 2012-01-28. ↑ Reiss, Mike. "Gronk earns AFC player of week honor - New England Patriots Blog". Espn.go.com. Retrieved 2012-01-28. ↑ "NFL Videos: Week 14: Hardest Working Man winner". Nfl.com. 2011-12-16. Retrieved 2012-01-28. ↑ "Rob Gronkowski sets TE yardage mark". ESPNBoston.com. January 1, 2012. Archived from the original on January 3, 2012. ↑ Kuharsky, Paul (2011-01-02). "All-Pro voting totals - AFC South Blog". Espn.go.com. Retrieved 2012-01-28. ↑ "Super Bowl XLVI as it happened". CNN. 2012-02-06. ↑ "Patriots TE Gronkowski undergoes back surgery - Yahoo! News". News.yahoo.com. 2013-06-18. Retrieved 2013-07-05. ↑ Pelissero, Tom (2013-10-18). "Patriots' Gronkowski cleared to play vs. Jets". USA Today. Retrieved 18 October 2013. ↑ "Rob Gronkowski may have ACL tear". ESPN.com. 2013-12-08. Retrieved 2013-12-08. ↑ "Rob Gronkowski out; tears ACL, MCL". ESPN.com. 9 December 2013. Retrieved 9 December 2013. ↑ "Tom Brady and Rob Gronkowski Roll Into the Record Books". The Boston Globe. Retrieved 27 October 2014. ↑ Gantt, Dan. "Rob Gronkowski fined $8,268 for bouncer move". ESPN. Retrieved 2015-04-23. ↑ Reiss, Mike. "Bruce Irvin fined $10K for scuffle". ESPN. Retrieved 2015-04-23. ↑ Rosenthal, Gregg. "Gronkowski, Patriots put on familiar show in 28-21 victory over Steelers.". www.nfl.com. NFL. Retrieved September 10, 2015. ↑ "Rob Gronkowski - New England Patriots - National Football League - Yahoo! Sports". Retrieved November 2, 2016. ↑ "Rob Gronkowski - New England Patriots - National Football League - Yahoo! Sports". Yahoo. Retrieved November 2, 2016. ↑ "Rob Gronkowski Sets Patriots Franchise Record With 69th Touchdown". Retrieved 2016-10-30. ↑ "Update on Rob Gronkowski". Patriots.com. December 1, 2016. ↑ "Rob Gronkowski". Retrieved November 2, 2016. ↑ Wilson, Ryan. "Patriots whip the Texans in Gronk's triumphant return: 10 things to know". CBSSports.com. Retrieved 2015-12-14. ↑ van der Pool, Lisa (2012-03-27). "Dunkin' signs 2-year sponsorship with Patriots' Gronkowski". Boston Business Journal. American City Business Journals. Retrieved 2013-12-31. ↑ Madden, Lance (2012-08-14). "Rob Gronkowski Becomes Endorser, Investor for Bodyarmor SuperDrink". Forbes. Forbes.com LLC. Retrieved 2013-12-31. ↑ Rovell, Darren (2012-09-22). "Gronk Flakes hitting New England shelves". ESPN Playbook. ESPN Internet Ventures. Retrieved 2013-12-31. ↑ Heitner, Darren. "Opendorse Raises $1.75 Million With Plans To Make Athlete Endorsements Smarter". Retrieved November 2, 2016. ↑ "Game on: Gronk gets cover of 'Madden NFL '17'". ESPN.com. Retrieved 2016-05-13. ↑ Southern, BY SCOTT MEES, The. "Pats' tight end almost played for Miners". Retrieved November 2, 2016. ↑ "Player Bio: Dan Gronkowski". University of Maryland Athletics. Retrieved 2009-01-12. ↑ "San Diego Chargers sign fullback Chris Gronkowski". Retrieved November 2, 2016. ↑ "Patriots add Glenn Gronkowski to practice squad". Retrieved November 2, 2016.